Noctilucent Clouds are finally here! Well, at least they were for me at about 3:00am on the 29th of June. I have heard that there have been some sightings, but for me, this mornings display heralds the new NLC season – a month later than usual? Conditions were amazingly warm, and the night was still and magical as I looked northwards from my home in West Berkshire UK. I couldn’t help but notice a burning bright star almost due North and quite low, Capella in the constellation of Auriga! This is when I spotted the first faint wisps of noctilucent cloud. Capella isn’t always in the North, but it is this time of year and it usually makes a guest appearance during morning noctilucent cloud displays. 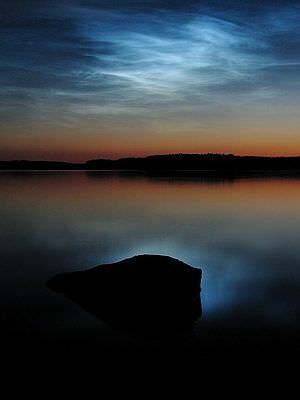 Noctilucent clouds are very rare and tenuous clouds on the edge of space and occur at altitudes of around 76 to 85 kilometers (47 to 53 miles). Will you see any NLC’s?